Our Zendesk write-back was upgraded in June 2018. If you began using Zendesk Thermometers before that date, then you will be using the original version of our write-back, as detailed below. However, if you are new to Zendesk Thermometers, please see our latest instructions for Writing back responses into Zendesk. If you would like to switch to using our new write-back instead of the method below, please contact us at ministry@customerthermometer.com and we will enable it on your account. If you haven’t created your Thermometer yet, you’ll need to start by following our Guide to Setting up a Zendesk Thermometer. 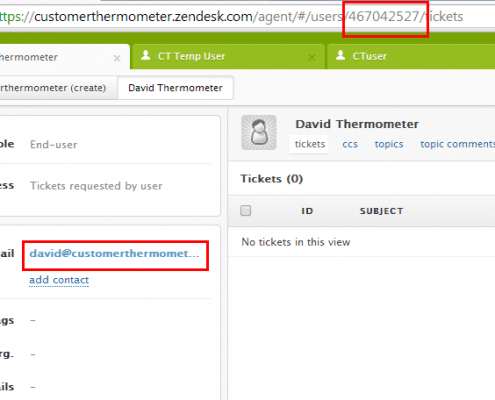 During your Thermometer set-up you will be prompted to add your Zendesk write-back credentials, including an Admin User’s details, the API key, and a dummy End-user’s details. This guide below will explain how to obtain this information from your Zendesk account. NOTE: you will need to be an Admin user of your Zendesk account to find this information. 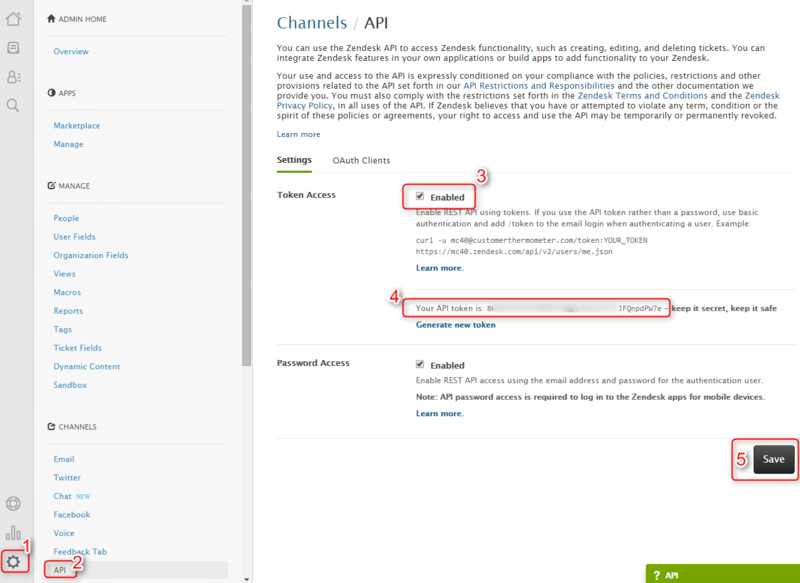 Use the screenshot below to find your Zendesk API token. Note the one showed below is blurred out for security reasons. Tick the box as shown to display the key. Highlight the key and then copy and paste it into the relevant field inside your Thermometer. NOTE: Be careful not to include a space at the end. Click the SAVE button as show in the diagram above (5). This is important and will enable the API. This is the email address of an account login with administrative rights. You will need to create a new End-user within your Zendesk account. The process works by transferring the ticket to another End-user and then back again in this process. You will not see anything happen within your Zendesk account – it’s a one time setup to ensure this writing back works correctly. Add an email address you have access to. You will need that to reset the account password shortly. Create a new End User. Click “+add” on the top left of the top menu and then select user. Type a name, Email address and select the role “End user”. You will then receive a welcome email. Create a password and verify your account. Make sure you are logged out from your Zendesk account before you complete this verification. Log back in as an admin, go to that End-user’s page inside your Zendesk account – and copy the user ID from the URL shown in the image below. Enter that into the User ID field in the Embedded Thermometer build screen. Enter the password you used to create that end user account. Finish the remainder of your Thermometer and click save.